Chesil Beach can often be over rated at many times of the year, but summer is not one of those times. It is when it comes into it’s own and out-fishes just about every other mark in the country. The diversity of species is incredible. How many other marks do you know where you can catch Pout, Poor Cod, Codling, Gurnard, Bream, Smoothound, Conger eel, Rays, Plaice, Trigger fish, Pollock, Bass, Mackerel, Scad, Shad, Red Mullet, Grey Mullet, Wrasse and Garfish all in the course of the day. They are just some of the species that Chesil regularly produces in August. Many anglers ask me where is the best spot to fish this month. If you want to improve your chances of Plaice then you need to head to the western end of the Beach. For those that don’t know where that is, it is Abbotsbury, West Bexington and for those that don’t mind a trek you can try Cogden. 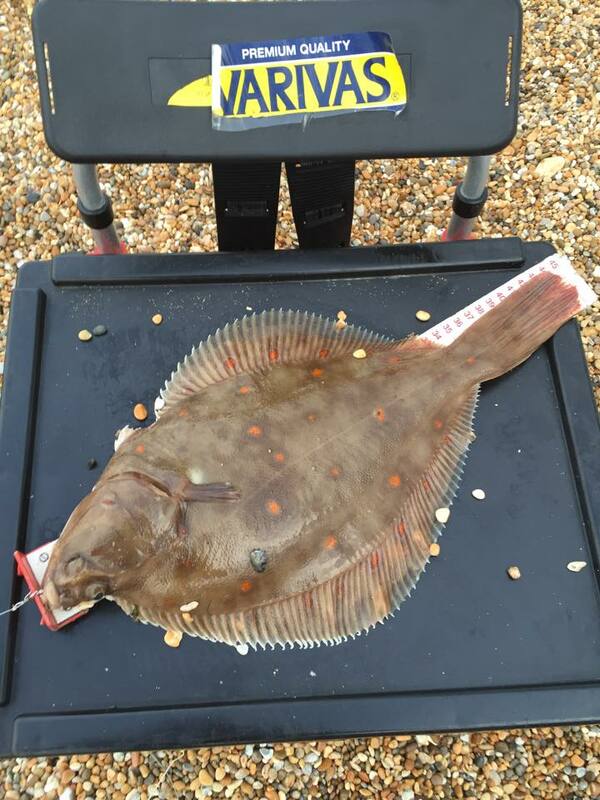 This is the end that regular contributor Ben Stockley fished this week and found a number of fine plump Plaice. You get a lot of the other species that I mentioned earlier from the same end of the beach, but for me the Ferrybridge area is my favourite. You can pick up some nice Plaice there as well, but for species such as Bream and Trigger Fish it is far better. The diversity of species is also greater, with the exception of the Ray species, I have caught every one of the others on the list between Ferrybridge and Chesil Cove. 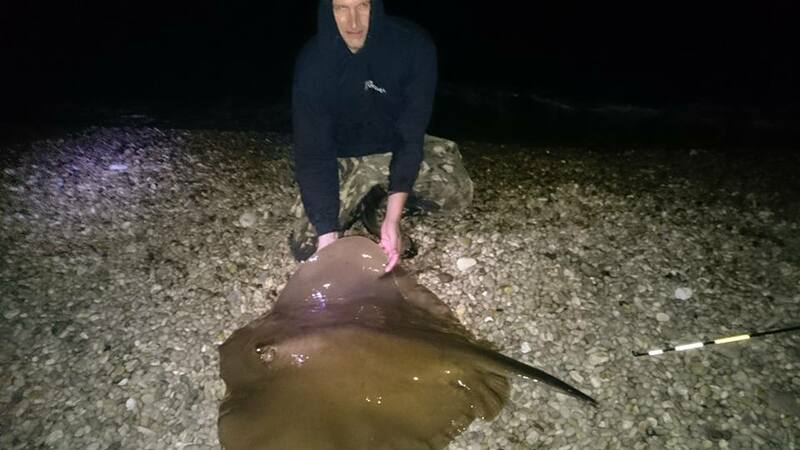 Lets not forget that the British Record Stingray came from the Chesil Cove area last year. The other most common question I get asked, is what is the best bait to use. For summer fishing you can’t go far wrong with Mackerel. You can use it in many different ways. A Mackerel head cast out 10yds is brilliant for Bass. Use a whole fillet for Rays and Conger, or cut it into small strips for just about every other species. I have had my biggest Grey Mullet on float fished Mackerel strip, whilst fishing for Garfish. Talking of Garfish, August is when they turn up in numbers on the beach and around the piers. For those of you who have not seen my how to catch Garfish video, have a look at it, to see how easy it is. One of my other favourite baits is Peeler Crab. It has to be live Peeler for me. When I have it, I am always confident of catching a large fish. There are still plenty of Smoothound around at this time of year and they love Peeler. Chesil Beach forecast: It really is a case of getting on the beach and trying to catch as many species as you can. As I mentioned earlier you could catch just about anything. If you want a hectic half hour of sport then use small metal lures or float fished Mackerel strip at dawn and dusk. The number of Scad, Garfish and Mackerel that are normally around for that short period, will blow your mind. Portland: WIth clear water, the Pollock and mackerel will be around in numbers. Once again dawn and dusk are the best times for the Pollock. Wrasse are very easy to catch at the moment. You can target them using soft plastic lures or bait and you are almost guaranteed of catching. Use a float set up to avoid tackle losses if you are using bait. Ragworm is by far the best bait to use. If you fancy a spot of Conger fishing then you are better off trying after dark. Portland is home to some huge Eels. Portland Harbour: There are plenty of fish all around Portland Harbour. Bass, Gilthead and Black Bream, Mullet and Flounder can all be caught during the day. First and last light will see large shoals of Mackerel and Scad move close to the shore, even in shallow water. The biggest problem for daytime anglers will be other beach users, especially wind and kite surfers. Weymouth Bay: Chesil BEach is not the only place to fish in the area. Weymouth Harbour and Preston Beach produce plenty of fish. Once again the problem on the beach will be other water users, especially at Bowleaze Cove. During the day it is better to stick to the piers, which produce Pollock, Wrasse, Bream, Mackerel and Garfish to name but a few. After dark Preston fishes well for all sorts of flat fish and Rays. You have a good chance of a Bass and Smoothound as well. One Response to "Summer Fishing on Chesil"
Hi, my friends and I travel to chenille every year in August for a beach trip staying at East fleet farm camp site and always fish west bexington and would love to catch something different than just dogfish. Our fravorite fish is the flat fish dab flounder, ect. Are there any yo be caught on bexington beach and if so where about some and what bait. We normally fish just to the right of the car park. Thank you for any help you can give.